Now it’s officially official. 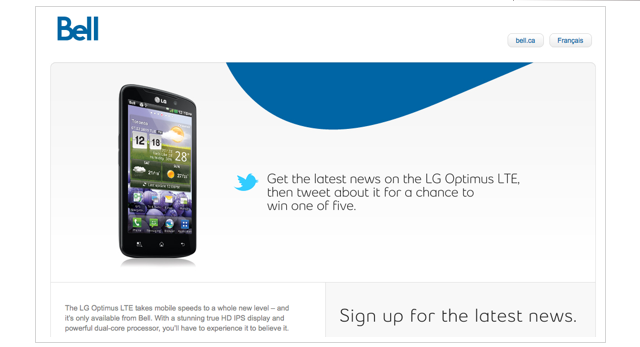 Bell has thrown up a pre-register page about their 2nd LTE-capable device, the “superphone” LG Optimus LTE. They state that the “LG Optimus LTE takes mobile speeds to a whole new level” and can potentially reach download speeds of up to 75 Mbps. The Optimus LTE has a 4.5” true HD IPS display, dual-core 1.5 GHz CPU, 1 GB of RAM, 8MP camera that captures 1080p HD videos, DLNA or MHL connectivity and Wi-Fi. Bell is also giving a chance to win one of these, once you sign up to keep updated on when it’s officially available – it’s coming late November – you can tweet about it and then “be automatically entered for a chance to win one of five LG Optimus LTE superphones”. The good news is that in the contest terms and conditions the fine print says that the Optimus LTE has an “Approx retail value $629.95 Cdn each”… so this is most likely the no-contract term price. In addition, the contest ends on November 25th, which could be the launch date.